Your Chromebook uses Google Docs for word processing. The formatting of your text on your document is important not only for style but for also adequately communicating your message. Font weight, slope, and size are all used to communicate meaning, emphasis, and more. Font face can also be useful for establishing a personality, tone, and brand. Docs gives you the ability to modify all of these characteristics of your text so that your documents look great and say what you want them to say! Using your touchpad, click and drag your cursor across the text you wish to select. Docs highlights the selected text. Using the Edit toolbar, click to open the Font menu. The Font menu is located directly to the left of the Font Size menu. In the Edit toolbar, the Font menu appears with the name of the font for the selected body of text. By default, all text uses the Arial font. Select one of the fonts listed. Your highlighted text is changed to the selected font. If no text was highlighted when you changed the font, the new font will apply only to new text. Any text typed from the current location of the cursor will appear with the font face of the selected font. Click the Font menu in the Edit toolbar. Select More Fonts to add additional fonts. The Font pop-up window, shown here, gives you a robust list of new fonts from which to choose. Scroll down through the list to reveal more fonts. 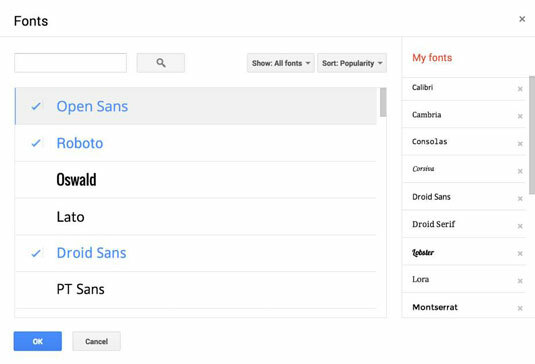 Select the desired fonts by clicking each. Each selected font is highlighted in blue and given a check mark. Click OK to finish adding the fonts to your Font menu and exit. When you are ready to change the font of your text, you will be able to choose one of your newly selected fonts from the Font menu. Open the Font menu in the Edit toolbar. The Font pop-up window appears. On the left of the window, a list of new fonts appears; on the right, a list of fonts currently in use by your Docs account. Scroll through the list of fonts currently in use and locate the font or fonts you wish to remove. Then, to remove the font, click the X located to the right of that font’s name. The font vanishes from the list of accessible fonts.